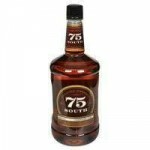 75 South is a lower-shelf, blended whiskey. I picked up a 1.75 Liter bottle of this at a Safeway store in Tucson, Arizona while my wife was shopping for wine for Thanksgiving dinner. I’ll be honest, when I checked out of the store, I still wasn’t sure if I was holding a bottle of bourbon or scotch. The label didn’t exactly go out of its way to explain what this brownish liquor was, either. The bottle simply read, Blended Whiskey. At $10.99 for a 1.75 Liter bottle, I figured it was a bargain whatever it was and I can drink either bourbon or scotch so the 75 South was worth sampling. The label, 75 South, sort of hinted to me that it tastes a little bit more like something from Kentucky than say, Scotland. There is a section of Interstate 75 South that runs through Tennessee,Kentucky,Georgia and Florida. Does that geography have something to do with its name? The whiskey looked a little darker in color which also made me think of the richer, darker taste of bourbon. I tend to gravitate more towards heavier whisky in the colder months of the season, so I wouldn’t mind having a bottle of bourbon on hand. This is a cheap, blended whiskey so don’t expect me to be overly descriptive. The nose of 75 South definitely suggests bourbon flavor. It is caramel-like with a hint of oak wood and sherry. The front of it tastes like bourbon; maybe a little thinner and with just a hint of maple. I expected the 75 South to have an awfully short-lived and harsh finish, but that wasn’t the case. To be sure, it has a thinner palate than Jim Beam or Maker’s Mark, but it not entirely unsmooth. For the price, I wouldn’t hesitate to buy 75 South for mixing or sipping on the rocks. I rarely like cheap whiskeys unless it’s scotch for mixing Rob Roys, 75 South is actually a bourbon like whiskey that I can enjoy by itself. On a scale of 1-100, I’d give 75 South whiskey a 79. Prior to this short write-up, I read another, less favorable review which had 75-South rated at 67 out of 100. I don’t understand such a harsh rating on a blended whisky that is not harsh at all. For only $2.00 more, I’d rather drink Ezra Brooks, but 75 South is not a bad tasting whiskey at all.